When I wrote this, six years ago, Tisha b’Av did not seem the most relevant of our festivals. I have no desire to see a third Temple on the Temple Mount, only to see peace there, an idea now as remote as that of rebuilding the Temple. Tisha b’Av, six years ago, seemed a conduit to historical troubles and tragedies, which, b’ezrat Hashem, we would remember but not relive. Now the year is 5775: antisemitism is present in Europe, America and of course in the Middle East. Our detractors even wish to deny us the word ‘antisemitism’, saying that we are not Semites – as if to say that antisemitism is culpable but hatred of Jews is acceptable. Some of us are critical of Israel, but our fate is nevertheless intertwined with it, bound like tefilin round the left arm. This year, we are truly bein hametzarim – between a rock and a hard place, between Israel and the diaspora. The coming shabbat will be Shabbat Chazon, the Sabbath of Vision, and the evening will be the onset of Tisha b’Av. I pray that we are all delivered safely through it, towards Shabbat Nachamu the following week: the shabbat of comfort. There’s an old joke to the effect that Jewish festivals can be summarized as follows: ‘They tried to kill us. We survived, let’s eat.’ I can’t tell you where this originated but it’s short, sweet and contains an element of truth. Many of our holy days commemorate historical occurrences outside our control, for example the slavery in Egypt or the wandering in the wilderness, or Haman’s plot. Then we celebrate our deliverance from the event through rituals of remembrance and sanctification: the seder, the succah, the reading of the Megillah. This doesn’t apply only to Jewish notable days. Armistice Day on 11 November works in the same way. A catastrophe comes at us from outside and we give it pattern and meaning and, in our case, a place in the Jewish calendar. Today is Shabbat Chazon, named after the first word of the haftarah, the first word in fact of the book of the prophet Isaiah. It means ‘vision’. When you see shabbat Chazon on our haftarah sheet, you know that the ninth day of the month of Av will occur in the coming week. It might seem that Tisha b’Av barely registers on the radar of most Reform Jews. However, anyone who has attended a shabbat service during the last three weeks will have heard one of the three haftarot of rebuke which fall in the three week period between 17 Tammuz and 9Av. Even if you don’t notice Tisha b’Av on the day itself, the season wafts past like a ripple in the air, every summer during the dog days. 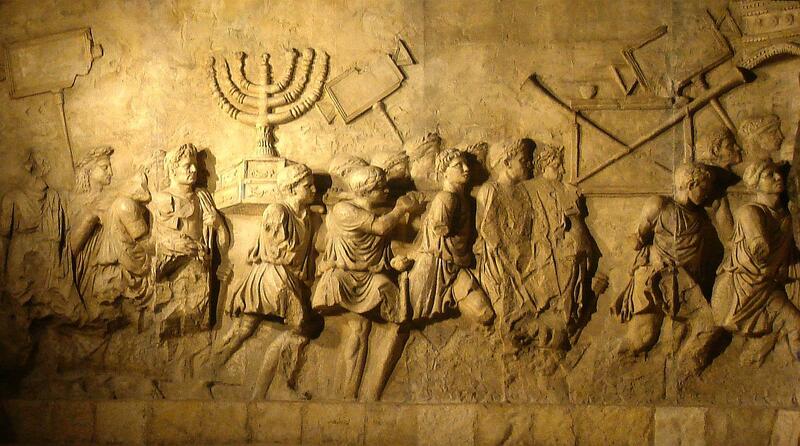 Tisha B’Av was a day of destruction for both the first and the second Temples in Jerusalem. The first was destroyed by the Babylonians under Nebuchadnezzar; the second by the Romans under Titus. It is a day associated with many disasters from Jewish history: the defeat of Bar Kokhba’s rebellion in 135, the expulsion of the Jews from England in 1290 and from Spain in 1492. Many tragedies also befell the Jews on 9 Av in the twentieth century, especially during the Shoah. The 17th of Tammuz, three weeks earlier, is the day when the Babylonians breached the walls of Jerusalem and later so did the Romans, give or take a day or two. The rabbis of the Mishnah set aside these days, to mourn and to fast. For their own reasons, the Babylonians also observed 9 Av as a day of sorrow, perhaps because the height of summer in that region is naturally a time of drought with its attendant dangers. This too may have encouraged the Israelites exiled in Babylon to look on the season as a time of mourning. The Babylonian exile lasted only fifty years and was followed by a return and a restoration, but the Roman triumph in 70 CE exiled the Jews until 1948. The Crusaders, the Inquisition, the Cossacks, the Nazis have all been likened to the Romans, doing their worst on Tisha B’Av. Sometimes, in Rabbinic literature, Rome was called Edom – Esau’s other name – a code which enabled the rabbis to refer to the Romans without alerting Roman censorship. The historian Martin Goodman suggests in his book Rome and Jerusalem that it was not so much Roman policy, as a series of uncontrollable developments which propelled events towards catastrophe. After the death of the emperor Nero, Vespasian and his son Titus became major contenders in the competition for power and, in this cause, much depended on a conclusive victory in Judea, their theatre of war. According to Josephus, Titus was reluctant to destroy the Temple in Jerusalem because he considered it a magnificent work and an ornament for the Roman empire. Josephus reported that the burning of the Temple came about when a Roman soldier, without orders, snatched up a burning brand and threw it into the Temple. When the Temple was destroyed, Titus’s only option was to proclaim a triumph and demonize his enemy, the people of Judea. The war with Rome is a history of attrition, ambition, chaos and expediency but it has also a religious significance, representing Jewish tragedies, both ancient and relatively recent, recalled through our modern understanding. The Jewish calendar is like a lens through which patterns in history come into focus and are more clearly visible and Tisha b’Av, for all its darkness, helps us to see the pattern when we hold the lens before our eyes. Bein haMetzarim, ‘between the straits’.